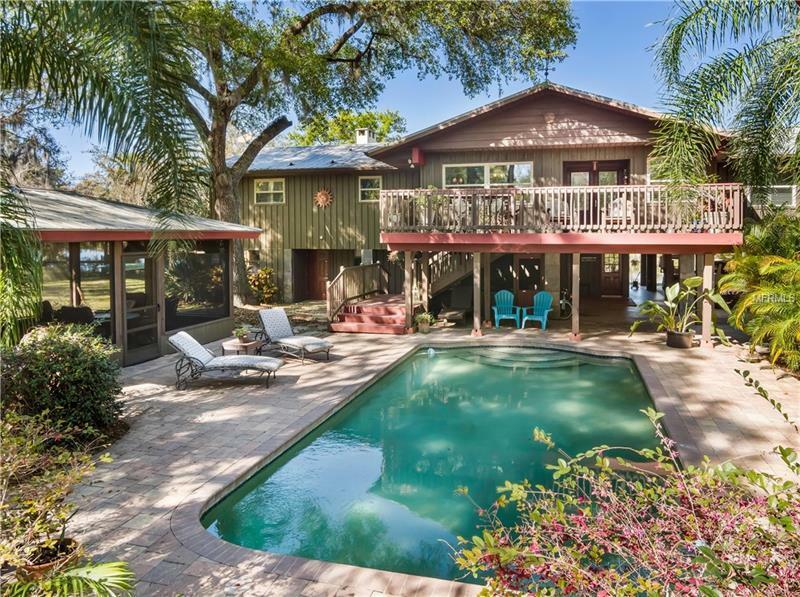 Your own private "Grand River Retreat" Nestled in âOld Florida on 5 Acres with over 200 LINEAL FEET of RIVER FRONTAGE. It is perfectly situated along the winding banks of the Manatee River to capture the magnificent River views from all vantage points. This extraordinary 3439 SF 5 bedrooms 3 baths Main home and separate 2 bedroom guest/studio house exemplifies the lodge retreat motif with the wood beam ceilings stone fireplace wood floors and 80' riverfront porch. Enjoy the pool/spa with party pavilion great for entertaining. The property has controlled access with an electronic monitored decorative Iron Rod Gate at the end of a private tree lined canopied drive. There is a private boat dock and ramp and a 30'x30' concrete floor garage/workshop or storage barn for all your toys. Be mesmerized by the beautiful River wildlife of manatees dolphins fish and birds. It is so quiet and peaceful yet just minutes from restaurants and shopping. NO CDD NO HOA NO DEED RESTRICTIONS bring your horses boats RV 4 wheelers OR what ever you like. Conveniently located with ease to interstate I-75 Sarasota Airport and Trip advisor's number 1 Beach in the world Siesta Key Beach. Adjacent are 2 additional River Front optional properties for sale totaling 12 Acres (including this site). Parcel 12709 UMR Dr. is 3.71 Acres with a 2013 SF home and parcel 12651 UMR Dr. is 3.3 Acres with a 1008 SF cottage.